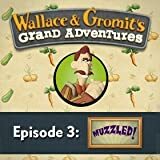 To celebrate 20th anniversary of Wallace and Gromit’s first animated short, A Grand Day Out, Telltale Games is giving away the free full version game of the third episode of Wallace & Gromit’s Grand Adventures, Muzzled! which normally costs $8.95 (aff) to purchase. Episode 3 of Wallace & Gromit’s Grant Adventures (Muzzled) has the story about shortly after the holiday season, a charity fair comes into town, run by Monty Muzzle, to raise money for a new dog shelter. After dealing with three strays in their home, Wallace and Gromit go to the fair with Wallace’s new invention to create any flavor of ice cream. At the fair, Gromit discovers that Mr. Muzzle is actually attempting to steal away the townspeople’s donations and using the strays as manual labor for the fair. When Wallace and Gromit uncover Mr. Muzzle’s intentions, he escapes on a makeshift balloon, but Wallace and Gromit give chase, denying Mr. Muzzle of his ill-gotten money while saving all the strays. Along the way, Ms. Flitt has grown to admire the “bravery” of Wallace, mistakes the fastening nut he is holding as an engagement ring and proposes a marriage from him. Click on “Click Here to Get It Free” to create an account with Telltale Games with valid email address and a password, followed by “Get Your Free Game” button. The unlock serial code will be emailed once account is successfully created, together with direct download link to the setup installer: Muzzled_Setup.exe. The free game promotional offer ends today, November 9, 2009. So grab it fast. Tip: Check out instructions and walkthrough on how to play the game using PC keyboard controls during gameplay here.